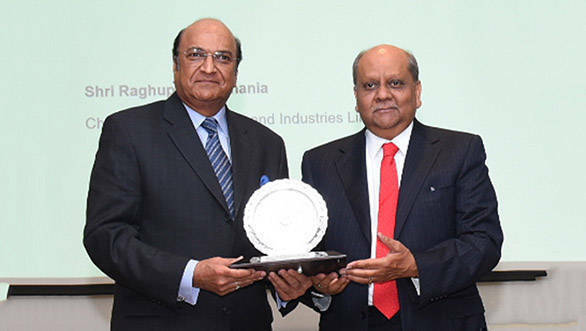 At a recently held event by the Udaipur Chamber of Commerce & Industry (UCCI) in Udaipur, Dr. Raghupati Singhania, Chairman and Managing Director, JK Tyre and Industries Ltd. received the Lifetime Achievement Award 2019. This prestigious award was given to Singhania over his visionary leadership, determination, humanitarianism and exemplary community services. The award was presented by Shobana Kamineni, executive vice chairman of Apollo Enterprise Limited and Hans Raj Choudhary, president, UCCI. "I am humbled and grateful to receive the Lifetime Achievement Award 2019 from Udaipur Chamber of Commerce & Industry. I dedicate this award to over 30,000 people of the JK Group. It is their hard work and dedication that has culminated in the success we have achieved over the years. I would also like to congratulate UCCI for the excellent work being done in promoting the cause of trade and industry in this part of Rajasthan. I wish them profound success in this great endeavour," commented Dr. Singhania. Additionally, JK Tyre & Industries also received the P.P. Singhal CSR Award for second consecutive year for the community development initiatives undertaken in Rajasthan. The company's CSR initiatives aim to provide solutions for a sustainable livelihood to local communities. Also, the company has been running adult literacy programmes since 2004 at all its manufacturing locations in the country. JK Tyre started the Parivartan Project in the tribal areas of Kankrol, a program that provides maternal and child healthcare services to community members and claims to have brought down maternal and infant mortality rates in the region.